My four Emerald Hills novellas are featured on Jen’s blog right now for her Friday Foodie Affair: http://lratrandom.blogspot.com/. Jen was one of the first people I met when I joined Goodreads, and like so many of the people I’ve met in the groups I joined there, she’s enriched my writing and reading. For her foodie blog, she did an author interview and posted one of my recipes, too. In the interview, she asked if I had other Emerald Hills novellas in mind to write, and at the time, I did. I finished two more, but I’ve decided to use those to close out the series. 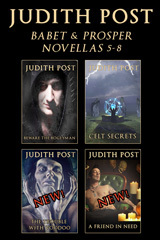 I hope to make the six of them into a bundle and start concentrating on writing more novels, less novellas. I’m happy I wrote the Emerald Hills series. I’ve always been a plot driven person, but I wanted to focus on more romance in those stories. I started out small. I hung More Than Bonbons on a mystery frame and padded it with Tana and Nate’s sparring and attraction. I added even more mystery for Mallory’s Magical Gourds, but by the time I reached Sheri Hits The Right Notes, I was getting more comfortable with characters driving the story line. Sole Responsibilities doesn’t have any mystery at all. And I liked it that way. I’m glad I tried something new, something outside my comfort zone, for that series. I learned a lot. Clues and action are great, but so are misunderstandings, conflicting goals, and chaotic emotions for creating conflict and tension. By concentrating on trying to get two people together, I had to amplify the give and take of relationships, the nuances that hint at something more, and for me, what seemed nearly impossible–filling 40+ pages with two people taking one step at a time toward becoming a couple. I didn’t think I had romance in me, but I did. And it’s made me a better writer. I like to try things in my writing that I’m not the best at, so that I concentrate on the “how to” of getting them right. I hope I always keep growing as a writer. Sometimes I bomb, and then I have to shift gears and grit my teeth for rewrites. But that’s what second and third drafts are for, right? So for me, it’s worth taking a chance and flexing muscles I don’t have yet, but muscles I just might get. ‹ PreviousWriting: Who are your favorite writers & Do they influence you? Thanks. I do my stretching in small doses for novellas and then try to work what I learned into novels.